Specially designed to meet the functional requirements of our huge clientele base, we provide an encompassing range of shaft power presses, cross shaft power press, press cross shaft, power press cross shaft. 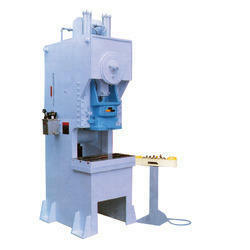 The power presses are available in 250 tons capacity and provides enduring and fast performance. Its high torque and temperature stable friction lining further enhances the durability and functionality of these shafts. The variety of power press cross shaft manufactured by us have robust construction and is integrated with sophisticated designs to make them abrasion resistant. Its straightforward installation and easy maintainability makes to them extremely popular among our clients. They are available in mechanical and pneumatic clutch versions. Looking for “Cross Shaft Power Presses”?